ewness is in the air and on the pages of our latest look book. MATOUK, SFERRA, SCHLOSSBERG, YVES DELORME and our many other fine bed and bath linen designers have exceeded our expectations once again. Please enjoy our latest that combines thoughtful fabrics, colors and designs in unison with time. Did you know, for 36 years and counting, DEWOOLFSON has been meticulously filling and stitching down fillers to create the finest down pillows, comforters and featherbeds? These are the items that truly elevate a bed and a night's sleep . . . from nice to exceptional. Click on any item within this look book to be taken to a coordinating page on our merchant website - www.dewoolfsonlinens.com - where you can discover other fine bed, bath and table linens and home decor. Super fine cotton voile with hand stitch colored thread. Coverlet and sham. Machine wash. Many colors. KOMALA Duvet Cover JOHN ROBSHAW Middle Eastern inspired design print. Long-staple combed cotton percale. Machine wash.
More... STITCHED Bed Linens JOHN ROBSHAW Choice of hand embroidery thread color on white cotton percale sheets and cases. More... QUODDY Day Blanket BRAHMS MOUNT Breton red and neutral stripe colors. Plain weave cotton and linen. Made in the U.S.A. Machine wash. Repeating design block printed and embroidered on linen and cotton blend fabric. Handstitched edge finish. Machine wash cover. Nature-inspired design. Overwoven effect chosen for texture. Cotton and linen blend. Coordinating towels, rug and robe. Machine wash.
AILES Decorative Pillow IOSIS Embroidered butterfly. 3 colorways. 100% linen. Made in France. OISEAUX Duvet Cover PINE CONE HILL French painting inspired. Stylized floral imagery printed on cotton sateen fabric. Crafted by artisans committed to fair-trade practices. Machine wash.
Kantha quilted cotton gauze. Irregularly quilted pom poms among uniform striped stitching. 2 colors. Minute and repetitive organic blue print on Italian cotton and linen blended fabric combined with white Egyptian cotton percale. Top of the bed duvet cover & sham, flat & fitted sheet and cases. Made in the U.S.A.
BELA Bath Towel GRACCIOZA Allover blue floral on 700 gram white cotton. Bias binding. Made in Portugal. ARUBA Totes IOSIS Bamboo-inspired printed imagery on 100% linen. Made in France. 2 colors. 4 sizes. MIDNIGHT Bath Rug ABYSS & HABIDECOR Vivid, cosmic swirl of color made with a blend of Giza - extra long staple Egyptian cotton and lurex metallic yarns. Made in Portugal. ABELHA Bath Towel ABYSS & HABIDECORâ&#x201E;˘ Solid color Giza - extra long staple Egyptian cotton. Finished with a wide band. Many colors and sizes. FALBALA Decorative Pillow IOSIS Vivid, cosmic swirl made with a blend of Giza - extra long staple Egyptian cotton and lurex metallic yarns. 18-inch square. 3 colorways. Made in Portugal. More... RANDOM Bath Robe & Towels GRACCIOZA Bath robes - 3 sizes - made with extra long loops of the finest cotton and combined with a touch of linen. Cotton towels made with the same fine cotton are white one side and random monochromatic stripes on the other. Monochromatic floral print on Egyptian cotton percale. Duvet cover & shams, flat & fitted sheets. Made in the U.S.A. of Italian fabric. Printed, ginkgo-inspired ensemble - duvet cover, shams, quilted coverlet, flat & fitted sheets, and decorative pillow. Longstaple cotton percale. Made in France. FESTIVAL Table Linens SFERRA 101 solid color choices. 100% linen. Hemstitch finish. Tablecloths, runners, placemats and napkins. Jacquard woven, colorful and inspired tablecloth. Cotton blend with an acrylic coating. Easy care. 3 colorways. ATHENA Bed Linens YVES DELORME French-made Egyptian cotton percale with bordon stitched borders. White with choice of stitching color. More... EGĂ&#x2030;E Throw YVES DELORME Cream-colored baby alpaca throw with bands of a single color of choice. Made in France. More... IDYLLE OISEAU Decorative Pillow IOSIS 18-inch woven tapestry. Made in France. 3 colorways. More... WALTON Bed Linens YVES DELORME Unique "Venetian" hemstitch that connects to an attached border in a single color of your choice. Made in France. 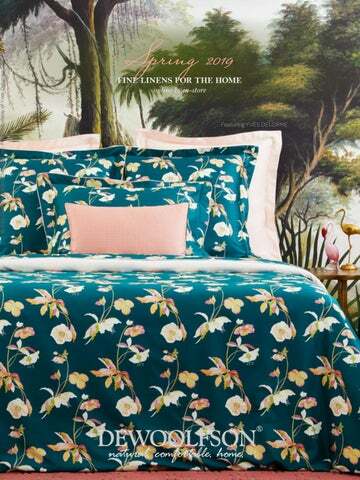 Ă&#x2030;TĂ&#x2030; Bed Linens YVES DELORME Tropical-infused ensemble. Coordinating duvet cover, shams, quilted coverlet, flat and fitted sheet, decorative pillow, foot quilt and throw. Quilted with Indian-inspired medallion. Cotton voile. Indian-inspired medallion print with wide repeating border. Hand-quilting on cotton voile. Coordinating stripe pattern reverse. Choice of hand embroidery thread color on white cotton percale sheets and cases. MALIBOU Bath Rug ABYSS & HABIDECOR™ Sand and surf underfoot. 100% Giza long-staple Egyptian cotton. Made in Portugal. CANEDO Bath Robe SFERRA Subtle diamond-weave cotton velour outside. Terry cloth inside. White. 3 sizes. Best selling towels. 60+ solid colors. 100% Giza 70 long-staple Egyptian cotton. 700 grams. Continuous bias trim. Curved corners. SAVANNAH Quilted Coverlet HOME TRESURES Cotton. Timeless pattern. Subdued hues. Made in the U.S.A.
Best selling. Classic style. Italian woven Egyptian cotton sateen duvet cover, sham, flat and fitted sheet, and cases. Numerous solid colors. Hemstitch flange finish. Linen and cotton blend cover inspired by neat garden rows. More... HUNIR European Sham JOHN ROBSHAW Dots and drops printed in light and dark indigo on cotton percale. Hand-stitched edging. More... PACCHA SAFFRON Decorative Pillow JOHN ROBSHAW Painterly, hand-blocked light indigo lines and drops contrast with saffron color cotton and linen fabric ground. Japanese-inspired, intricate navy print on white cotton percale. Ornate and softly worn top-ofthe-bed. Duvet cover and sham. Cotton voile is paired with Italian tone-on-tone cotton percale for two experiences and light texture. 4 colors. Made in the U.S.A.
Quilted Coverlets HOME TREASURES Select quilt patterns. Each woven onto Royal Sateen extra-long staple cotton sateen. Many colors. Made in the U.S.A.
© 2006-2019 DEWOOLFSON Linens Int’l., Inc. It 's a beautiful comforter and so very cozy and warm"
Our full length body pillows provide complete torso support while you sleep. Enjoy sitting-up in bed? This pillow makes a great bolster to rest against the headboard. or . No more Baffled boxes in each half of our DUAL ZONE CAMBRIC comforters are filled to the desired warmth with 650 fill-power white goose down while the center column of baffle boxes are filled with a compromising amount. Our FEATHERBEDS provide a level of sleep comfort that's unsurpassed. Several times thicker than most. "...Laying on it has to be experienced to be believed ‐ So sweet. " -Richard J.
Baffled-box construction. Three down/feather blend fills. Proven downproof fabric. © 2019 DEWOOLFSON DOWN INT’L., INC. Photography courtesy of the respective copyright holders.